The best line of defense against identity theft is prevention, but when that fails you need to handle the situation correctly and swiftly. If you notice any mysterious purchases or your bank contacts you about confirming charges, your account may be compromised. If you believe that someone has stolen your identity, minimize the damage by following these steps. The most common (and sometimes the only) way to discover compromised accounts is noticing fraudulent charges after they’ve posted. When you become aware of the situation, contact your financial institution as soon as possible, dispute the charges, and ask to either lock or close your account. Next, you need to pull up your other accounts and scan old statements for additional charges you don’t recognize. If you find any questionable charges, call your financial institution and alert them of the problem. You may have to put a lock on a number of your accounts if your identity has in fact been stolen. When assessing whether you’re a victim of credit card fraud or identity theft, your last stop should be your credit report. By law, you’re entitled to at least one free credit report from each credit reporting agency every year. Request your reports and look for any account that you don’t recognize. After you have a pretty good handle on the extent of your problem, you need to file a report with the Federal Trade Commission. You only need to do this if you think that your identity has been stolen. The FTC doesn’t handle credit card fraud, so if only one account was touched you probably aren’t a victim of identity theft and don’t need to submit a report. A fraud alert puts a red flag on your credit report and notifies both lenders and creditors that they should take extra steps to verify your identity before extending credit. All you have to do is call one of the three credit reporting agencies to place a 90-day alert on your reports. Don’t worry about any potential stigma that could come with this, it is a rather common practice nowadays. Most financial institutions advise opening up new accounts following identity theft, even those that might not have been compromised. After all is done, make sure that you implement preventative measures going forward. There are plenty of ways to make yourself a less likely target and they all take less work than recovering from being a victim. Don’t wait until it’s too late! Be sure to enroll in First Financial’s Identity Theft Protection Program from Sherpa today. The best part? You can enroll right online, 24/7. You can trust in First Financial and Sherpa to help keep your personal information protected. Packages begin at just $5.99 per month – so click here to enroll today! There are several things people freak out about when their wallets or purses have been stolen: knowing a thief has your ID (and your home address), losing irreplaceable gift cards or cash, and having to cancel your credit cards. That’s usually the first thing people do — call their banks, but it’s easy to act quickly when you realize you’ve been robbed. Sometimes, it’s not that simple. Thieves steal credit and debit cards all the time without taking the physical card. The most common kind of card theft results from data breaches. Each year, millions of U.S. consumers have their cards replaced after their information was compromised in one of the many massive cyberattacks on retailers, even if their cards didn’t show unauthorized activity. People have gotten used to the idea that data breaches are inevitable, but there are lots of daily activities that put your cards at risk for theft, without you noticing. A Pennsylvania woman was arrested for allegedly swiping customer cards on a personal card reader while she worked the drive-thru at a Dunkin’ Donuts, WFMZ reported, reportedly using the information to create duplicate cards and charge more than $800 to the accounts. That’s not the first time a story like this has popped up, and it’s likely to happen again, because the situation presents an easy theft opportunity to drive-thru workers: Customers hand over their cards and usually can’t see what the cashier is doing with it on the other side of the window. It’s not like you should avoid the drive-thru for fear of card theft, but it’s one of many reasons to regularly check your account and card activity for signs of unauthorized use. How often do you see your server process your dinner payment? Usually, he or she takes your card away from your table and completes the transaction out of your sight. Many restaurant workers have taken advantage of this situation to copy customers’ cards and fraudulently use the information. Once again, regularly check your account and card activity for signs of unauthorized use. People are pretty trusting when making orders over the phone, assuming that whoever takes the order is entering the credit or debit card number, expiration date and security code into a payment system, not just copying it down for their own use. On the flip side, it might not be the person on the other end of the call you should worry about — plenty of people read their card information aloud within earshot of strangers, making it easy for someone nearby to write down the numbers. Most radio-frequency identification (RFID)-enabled credit and debit cards have a symbol (four curved lines representing a signal emission) indicating the card has the technology for contactless payment. If you have one of these cards, you have the ability to use tap-and-pay terminals found at some retailers, because your card sends payment information via radio frequencies, received by the terminal. That same technology also allows thieves to use RFID scanners to copy your card data if they get close enough to it and your card isn’t protected. If you’re not sure your card has RFID technology, call your issuer, and if it does, use signal-blocking materials and products to protect it. Thieves have been installing copying devices at gas pumps and ATMs for years: They tamper with card readers to install skimmers that copy your card data when you swipe it, so a thief takes your credit or debit card information while you complete an otherwise routine transaction. Experts advise you look closely at card readers for signs of tampering, use ATMs serviced by your bank, and check your card activity regularly for signs of fraud. That’s really the best way to combat credit card theft: Watch closely for it. With online banking and mobile applications, it’s easy to check your accounts every day, making it more likely you’ll spot something out of the ordinary than if you only looked at card activity once a week or so. You can also check your credit score for sudden changes, which can be a sign of fraud or identity theft. Don’t wait until it’s too late! Check out First Financial’s ID Theft Protection products. To learn more, click here and enroll today! Article source courtesy of Christine DiGangi, Credit.com. There’s really only one way to protect yourself from identity theft. Stop spending money and trust no one. It’s pretty easy. OK, it isn’t easy. Talk to enough victims of identity theft, and you start to realize that it really can happen to anyone – and sometimes, no matter how careful you are, it can happen to you. That’s why it helps to study how people’s identities were stolen and learn from it. 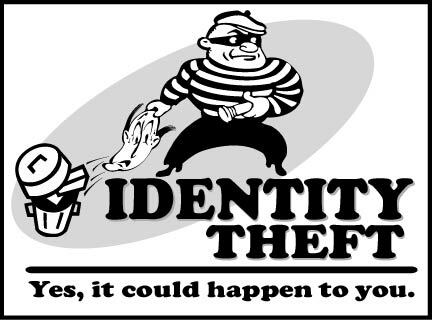 Here a few ways identity theft happens along with strategies to prevent it. 1. Information is out there for anyone to see. Of course you don’t want to leave credit card statements lying around in public places, and when you discard your financial paperwork, it’s smart to run it through a shredder. But sometimes when you’re out in the world, your information can’t help but become a little exposed. You type a PIN number onto a pad and realize someone might have been looking over your shoulder. You hand your credit card to a waiter, who disappears for a while with it. Or you’re in a crowded store, practically rubbing elbows with an identity thief. Sarah Dugo, co-founder of College Savings Dolls, got an unwanted education on identity theft when she was at a crowded Best Buy and bought a big-screen TV for the Super Bowl. “The cashier took my credit card and delivery information, but they left it all on the computer screen and walked away from the check-out area. I was at one of the checkouts in the smaller section of the store, not the main front exit,” Dugo says. It turns out that the thief used Dugo’s credit card information to order the same big-screen TV – and had it sent to his address. “That’s how they caught him,” Dugo says. Still, the crook did enough damage to her credit report and credit score that it took two years for her to straighten it all out. She was in one of those situations where the employee ringing her up was interrupted by a customer before finishing her transaction. Dugo isn’t positive, but she thinks that’s how someone was able to see her information and either jot everything down or snap a photo of the computer screen. Dugo isn’t sure what she could have done differently, but she figures that if she is ever shopping on another crowded weekend, she may make her purchase at the main entrance, where department sales clerks aren’t likely to be pulled away from the register. 2. You put your wallet or handbag in a vulnerable position. “Several years ago, I was shopping at a Safeway near my house. I was in the shampoo aisle and a well-dressed man asked me to help him find a product his wife asked him to get,” says Caren Kagan Evans, CEO of ECI Communications. While Evans pointed to the top shelf to show him where the product was, another man took Evans’ wallet out of her handbag, which was in the top part of her cart. Unfortunately, her Social Security Number was printed on her health insurance card, so the thief now had that information as well. Evans says she was lucky because she got her money back and was able to fix everything relatively quickly. “I have heard stories of people who had their identities stolen where the perpetrator took out mortgages on properties, and stories of people who literally spent years getting everything straightened out,” she says. As for where Evans went wrong, she says it is easy to look at the situation now and realize her handbag was vulnerable. It was in the top part of the cart, and she was never planning on leaving it out of her sight. So you could take away from this story that you should never trust a stranger, even one who simply wants some help finding shampoo – or, better yet, remember to keep your eye on your purse or wallet since somebody else otherwise will. 3. You trusted someone a little too much. Everyone knows the importance of vetting people who work for you, and yet you can never say it enough. Arthur Gregory is a serial entrepreneur. He’s a partner in two restaurants and owns EatUsa.net. The printer who made his menus overheard Gregory tell a colleague that he was looking for a bookkeeper. “I do that,” the printer said. And Gregory, who liked how his menus were made, figured he’d give him the job. As it turns out, the man was trustworthy when it came to menus, but not when it came to bookkeeping. “He stole my identity,” Gregory says. And he didn’t just go out to a department store and buy things in Gregory’s name. He took out corporate credit cards in Gregory’s name and tried to take over his business, contacting vendors and doing a ton of damage. He now keeps all of his personal information in a lock box, so not even his current bookkeeper can see it. Gregory, unfortunately, is also a case study in why it’s impossible to prevent identity theft. Even if you were willing to live out the rest of your life on a deserted island or in a cave to wall yourself off from problems, you could still discover you’re already a victim of identity theft. As you can see, identity theft is an immense problem throughout the world and only becoming more and more frequent. As previously stated, there is no way to completely prevent identity theft, but there are certainly ways to minimize your risk and protect your finances.To learn more about our ID Theft Protection products, click here and enroll today. Article source courtesy of Geoff Williams of US News. In terms of the recent data breaches, the data thieves were likely motivated by money. With credit and debit card information for tens of millions of cards, they could buy items with the credit cards and drain cash out of people’s accounts with the debit cards prior to being found out. While, as a consumer, you won’t ultimately be held responsible for false charges on your account from a breach, that doesn’t guarantee you’ll be free from any effort associated with the losses. While your card company probably had fraud monitoring capabilities that blocked much of the thieves’ charging, if your account did get wrongly charged, you still have to make sure it gets cleaned up. Cases like these — in which people’s card information gets stolen and used for nefarious purposes — illustrates one way that credit cards clearly beat debit cards. If you were shopping with a credit card during a data breach, all it would likely take is one phone call to your card company to get the charges reversed and the card replaced. In some cases, card issuers have been proactively replacing cards that were used during the breach window. If, on the other hand, you were shopping with a debit card, it gets a bit more challenging. You must contact the financial institution that issued your debit card within two days of noticing the theft, to be covered by its maximum guarantee. If the money came out of your checking account, your financial institution generally has 10 days to investigate the theft before deciding whether it has to refund the money. That’s 10 days after you report that your cash is missing from your account. That’s potentially 10 days of bounced checks, late payments, overdraft fees, returned check fees and all the other personal headaches associated with not having your money in your account. While credit cards are safer than debit cards when it comes to the fairly rare event of fraud, they can still be financially dangerous tools in everyday use. If you are going to use credit cards, be smart with them. Pay off your balance in full every month to avoid interest charges. You might even want to act like the money is coming directly out of your checking account as if it were a debit card by deducting it from your checkbook with each transaction. That way, you’ll know how much you really have available to spend on everything else to reduce your risk of overspending. As recent data breaches remind us, our digitally interconnected world can be a dangerous place for you and your money. While you can’t eliminate all financial risk from your life, you can mitigate the damage by staying vigilant and on top of your spending — no matter how you spend your money. Don’t wait until it’s too late! To learn more about our ID Theft Protection products, click here and enroll today.